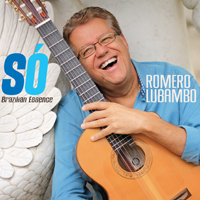 Romero Lubambo is an extraordinary Brazilian jazz guitarist. He has performed with inumerable great musicians, such as Dianne Reeves, Michael Brecker, Yo-Yo Ma, Kathleen Battle, Diana Krall, Herbie Mann, Wynton Marsalis, Gal Costa, Kurt Elling, Kenny Barron, Luciana Souza, Cyro Baptista, Sergio and Odair Assad, Ivan Lins, Grover Washington Jr., Vernon Reid, Flora Purim and Airto, Paquito D'Rivera, Harry Belafonte, Larry Coryell, Gato Barbieri, Leny Andrade, James Carter, Paula Robison, Dave Weckl, Jason Miles, and Cesar Camargo Mariano...to name a few. Please visit Romero's web site and his Wikipedia entry to learn more about him. 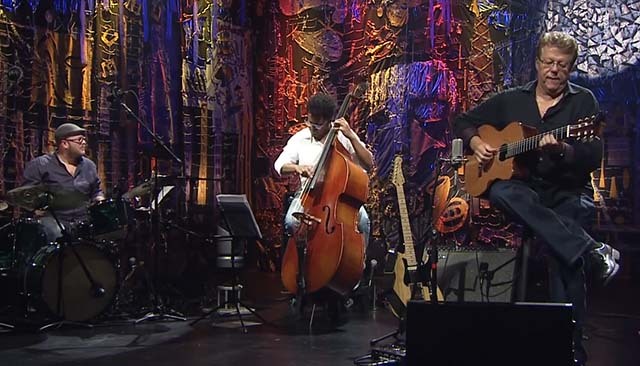 This first piece shows Romero in a dynamic Brasilian jazz trio with Sidiel Vieira on acoustic bass and Thiago "Big" Rabello on drums. The next item here from Romero is a piece from his latest album, SÓ: Brazilian Essence. This song was composed by Cesarr Carmargo Mariano and is entitled Samambaia. If you don't see a player above for this piece, you can play or download the item through one of the links below. In this video clip, Romero is playing a Prenkert cutaway guitars at the United Nations Jazzday concert. He is accompanying Stevie Wonder and Esperanza Spalding on the jazz standard "Midnight Sun". The links below can be used to watch the video in your browser. If the video will not play in your browser, you can right-click the download links and save the video on your desktop; from there, you should be able to view it with Windows Media Player or other video players. Midnight Sun was written in 1947 by Lionel Hampton and Sonny Burke. Johnny Mercer added the lyrics in 1954. 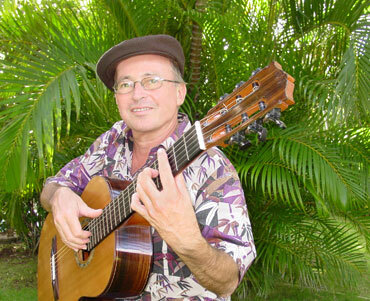 Carlos Barbosa-Lima has been regarded as one of the world's most versatile and creative acoustic guitarists for 40+ years. You can learn more about him by visiting his web site. First up is a video of Carlos and Larry Del Casale -- both playing Prenkert guitars. This is Carlos' own arrangement of Delicado, written by Valdir Azevedo. You can watch the video below at 720p resolution, or use this link to watch on YouTube at other resolutions, including 1080p HD. Next, I've chosen two pieces from his 2006 CD entitled "Carioca", on which Carlos is playing one of my cedar top guitars. "Cochichando" is a beautiful, bright performance with percussion. "Um A Zero" is an up-tempo tune which showcases the dynamics of his guitar (not to mention Carlos' virtuostic playing). These pieces are of course copyrighted, and you may use them for your own personal listening pleasure only. If you would like to hear more of Carlos and my guitars, his recordings are available on the Zoho Music label. You can find a list of distributors on their web site, www.zohomusic.com. Hear the sound of the hot guitar trio Triada, playing three of my spruce topped instruments! 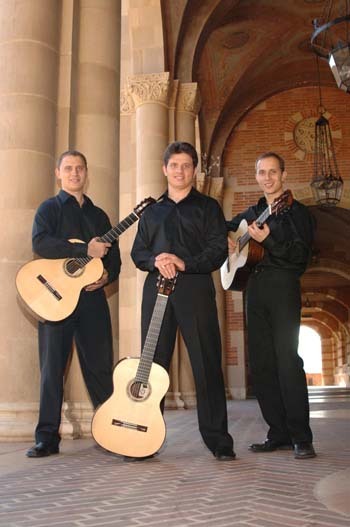 Triada consists of three brothers from Bulgaria -- Nikola, Petar and Vasil Chekardzhikov. This clip comes from a live performance at CSU Fullerton in May of 2006 where the group is performing "Toccata". Please take a minute to visit their web site here. The guitars played by the group on this piece are three extremely well matched spruce tops with the standard 650mm scale length. This composition has a lot of dynamic range so you can hear how my guitars perform over a wide range of volume levels. You can also watch a video of Triada performing a piece called Ruchenica. This was recorded on May 4, 2006 at Meng Concert Hall, California State University, Fullerton. The links below can be used to watch the video in your browser. If the video will not play in your browser, you can right-click the download link and save the video on your desktop; from there, you should be able to view it with Windows Media Player or other video players. This music and the performance is copyrighted by Triada. You may use it for your own personal listening only. Please contact the group if you wish to use the music for commercial purposes. David Grimes was first introduced to the guitar when he was a junior math major at Caltech and heard a recording of Andrés Segovia. He completed his degree in applied mathematics and subsequently worked at the Jet Propulsion Laboratory in Pasadena, California for several years while he pursued his guitar studies with Guy Horn and Oscar Ghiglia. As a soloist he has performed extensively throughout North America and Europe. Recent concert tours with duo partner Gregory Newton have taken him to Greece, Bulgaria, France, Malta, Norway, Sweden, Serbia, Montenegro and South Africa. David appears frequently as a conductor and as a competition judge. He is Music Director and principal conductor for the Orange County Guitar Orchestra. David's interest in the guitar's predecessors led to his edition of Luys Milán: the Complete Fantasias and the celebrated series Treasures of the Baroque , published by Mel Bay Publications. At the other end of the spectrum, he encourages and works actively with contemporary composers to create new guitar works. Many composers have been inspired to write pieces for guitar after hearing a David Grimes performance. His own compositions are now being performed by prominent guitarists throughout the world. Highly respected as a teacher and coach, David was Director of Guitar Studies for 37 years at California State University, Fullerton where he developed one of the nation's leading centers of guitar instruction, with one of the first fully comprehensive courses of guitar study. 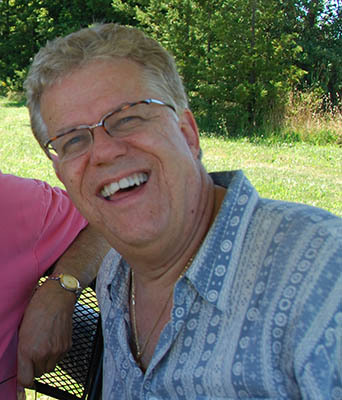 He is past President of the Guitar Foundation of America and continues as Reviews Editor for the journal Soundboard . On this track, David is playing a piece written by Angel Barrios called De Cadiz a La Habana . This performance is copyrighted and you may use it for your own personal listening only. If you don't see a player above for this piece, you can play or download the item by right-clicking one of the links below. These piece is copyrighted, and you may use it for your own personal listening pleasure only. More recordings will be added soon, so check back often!